The “Smile Expedition,” Hyosung (KRX:004800)’s overseas medical volunteer corps, opened a free clinic in Long Tho, a community with 1,800 residents near Ho Chi Minh City, Vietnam from Nov. 19-22. The corps consists of doctors and nurses and other volunteers who work in Korea Food for the Hungry International, Gangnam Severance Hospital and Jaseng Hospital of Korean Medicine. 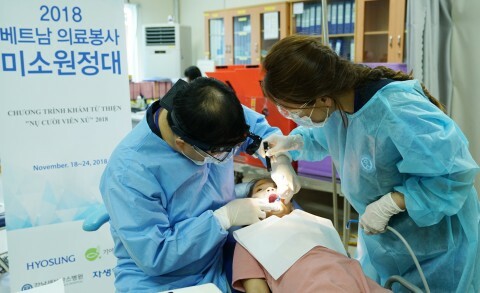 SEOUL--(뉴스와이어) 2018년 11월 29일 -- The “Smile Expedition,” Hyosung’s overseas medical volunteer corps, opened a free clinic in Long Tho, a community with 1,800 residents near Ho Chi Minh City, Vietnam from Nov. 19-22. The corps consists of doctors and nurses and other volunteers who work in Korea Food for the Hungry International, Gangnam Severance Hospital and Jaseng Hospital of Korean Medicine. This is the eighth year for the expedition to be dispatched. Thus far, the Smile Expedition has treated some 12,000 residents who were not entitled to health care benefits. “Hyosung will keep supporting Vietnamese communities as a member of the country’s society as well as carrying out social responsibilities as a global enterprise,” Hyosung Chairman Cho Hyun-Joon said. Chairman Cho Hyun-Joon has increased the number of medical specialities of the corps each year to provide various medical services to as many residents as possible. In 2014, he invited two patients -- one suffering complications of bone fractures and the other with the skull dent -- to Korea for surgeries, and paid all expenses for the operations. They were among the patients the Smile Expedition took care of. In 2016, he added ophthalmology to the medical services provided by the corps, which sent free eyeglasses to 44 dim-sighted elementary schoolchildren. For the first time this year, the Smile Expedition conducted echocardiogram on those who were at the risk of cardiac disorders. Meanwhile, Chairman Cho Hyun-Joon visited poor residents near Hyosung headquarters in Seoul on a sweltering day in August and gave watermelons and rice to them, wishing them good health despite record heat. He urged Hyosung employees to pay attention to the needy neighbours in local communities.